Let's train the sound by wearing a sense of pitch. I can not sing well unless I can get the key. Let's practice the foundation if you are not good at it. Test your perfect chord pitch(absolute chord pitch). Basic sound feeling will be on time now. As long as you do it, the sound increases. Pronunciation is improved by training. 1. First of all, please listen to the sound. 2. Tap the notes you play with the keyboard. 3. In case of correct answer I will go to the next stage. 4. In case of incorrect answer, use the keyboard to hear the ringing sound again Please tap. 5. 10 Time taken during game is the score and Become. 6. Answer as soon as possible and short time to other Please compete with the players. When you clear it, the remaining game scores will be added. Clear the surface to advance. The time taken during the game is displayed as the score. I play the game with the sound of the white key. The three sounds will be at the same time. The number of games on stage will be 5 games. Both white key and black key sounds. The number of games on the stage will be 10 games. The five sounds will be at the same time. I have a track record of 300,000 people. If you are confident, please compete with people speed. Free, so let's try it first. Piano performance is essential for instrument performance. 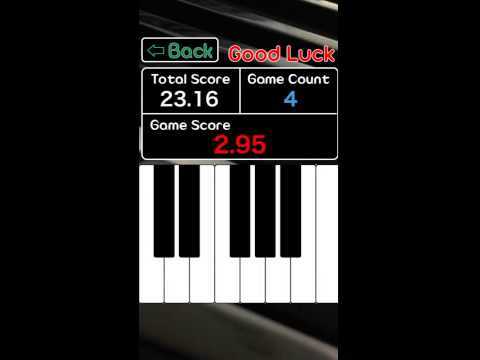 With this application, you can practice the sound with the sense of the game.